A-Fuente Gran Reserva is more that just the finest smoking enjoyment a cigar lover can experience, it represents Four Generations of family tradition, that include love, pride, and personal sacrifices. Every A-Fuente cigar carries the personal family touch that makes it one of the world's finest. Only the highest quality vintage tobaccos and hand workmanship go into A-Fuente cigars, making them a blend of art and craftsmanship. Each leaf is personally selected from a private family reserve set aside exclusively for the making of these cigars. Blended with the finest "Fuente Tobaccos" internationally recognized for their superiority, the A-Fuente Gran Reserva is then skillfully rolled with African Cameroon, Connecticut Shade or the most recent addition to the Gran Reserva line, Ecuadorian Sun Grown, these wrapper tobaccos are the most expensive and sought after wrapper tobacco in the world. The honor of making the A-Fuente Gran Reserva is given only to the most gifted cigar makers, those with the rare skills needed o create this uniquely blended cigar. Taking absolutely no short cuts, every critical step is done completely by hand, to ensure a finished cigar without parallel. A Fuente cigars are then aged in Spanish Cedar vaults to a peak of perfection to create a marriage of the blends producing an excellent "individualistic" heavyweight cigar to be counted among the worlds finest. A Fuente Gran Reserva guaranteed one quality only "The Finest"
This is a very good smoke. Great taste, nice draw with an even burn. It Is full flavored. Great for those times you don't have time to smoke a Hemingway. A good mild flavor,I like the gauge of the cigar and the Length of the smoking time. A very good small cigar for my coffee break,smooth flavor without much tar build-up. This is a fine little cigar that I smoke daily. Just enough to satisfy my desire to smoke with rich flavor and the quality of a Arturo Fuente cigar. Very good medium flavor. I prefer the Maduro wrapper. Size is good for when you don't have time for a Churchhill. I have smoked this cigar for years. I like the size. It can be smoked in around 20 minutes. It has an excellent taste and is very smooth. This cigar by Fuente is alway enjoyable I having been buying them for years and I have never been disappointed in the taste and aroma. One of the best cigars! This cigar is by far one of the best cigars out there. It has a robust flavor and great draw. Have been smoking them for years and the product is always consistent. I have been smoking this cigar for many years and the flavor and taste are always consistent. Robust and smooth. Good little cigar. Will purchase again. Perfect Maduro for a quick smoke. Easy draw but will need to be relit if left for a minute or so. A great tasting cigar. I just love the flavor. Would recommend to other smokers. If you like a full robust cigar but don't have the time for a Corona or other full-size cigar, keep a box of the AF Exquisitos Maduro on hand. You'll get a fifteen-twenty minute smoke that satisfies and which you can leave without feeling like you've left in the middle of a good thing (or wasted your money!). Excellent cigar, cigar price, and seller! A smaller cigar with big cigar flavor. Just right for me on most occasions. Provides an exceptionally long smoke for a cigar of its size. All of Arturo Fuente's smaller cigars from the Petit Corona on down to the Exquitos, are mainstays in my rotation. I prefer the Maduro wrapper. They are meticulously crafted with fine tasting Dominican Tobacco. Great flavor & aroma...a keeper for me. Excellent little cigar in all respects, IMHO. I smoke them daily. One of my favorites. 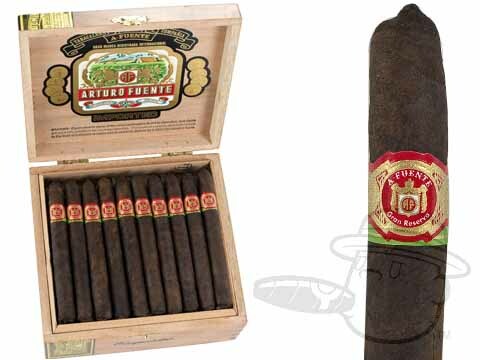 Arturo Fuente Exquisitos Maduro is rated 4.4 out of 5 based on 26 customer ratings.